Still not ready to give up summer, so you get a cabin for a night or two on a lake and keep the spirit alive. So many meal opportunities. There will be pancakes and bacon, strong coffee, BLTs with avocado, chips (with ridges! ), smoked trout on crackers with cocktails, and of course ice cream. 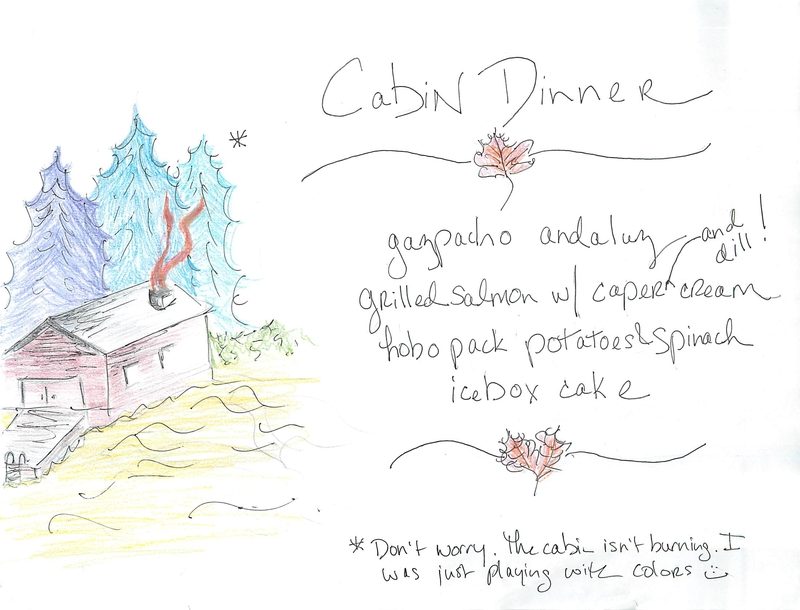 For one dinner you might go cabin style and do a Chili Night. Make the second dinner a plated affair. In the morning, blend the gazpacho and create the icebox cake. Assemble your potato foil packets. Go hiking then swim in the lake. Around dinnertime, get your grill going. Have someone mix together sour cream, capers and dill. Someone else mixes up cocktails and sets the table. Once the salmon and potatoes come off the grill, dinner is served. The Gazpacho – so many recipes – this one looks great. Potato/Spinach packets, consider THIS for inspiration. Classic Icebox Cake, because you don’t need to spend time baking this weekend. Posted on September 9, 2015 October 15, 2015 by Kylie SachsPosted in dinner, make aheadTagged cooking, food, menu, recipes, savegourmet.